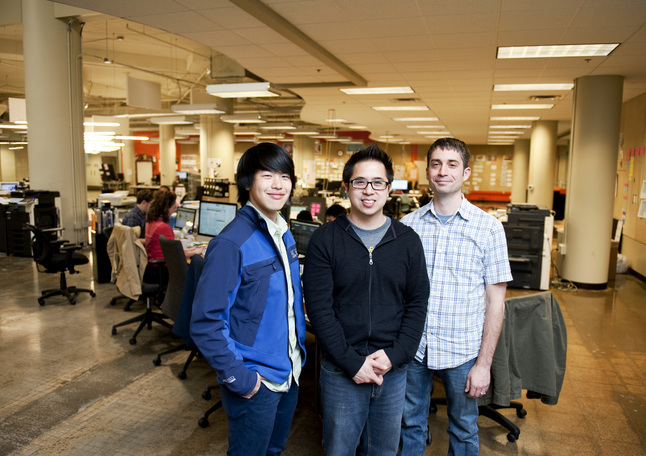 Posted on Mon, May 20, 2013 : 5:58 a.m.
CEO Moses Lee (center) with co-founder David Jsa (left) and vice president of technology Mike Deming (right) at Seelio's office space in Menlo Innovations. In the month leading up to the Michigan Growth Capital Symposium, Ann Arbor startups have been attracting a number of venture capital investments. Web-based startup Seelio, short for “see my portfolio,” is one of four companies that have closed funding rounds recently, completing a seed round that brought in $900,000. Company officials say it can be difficult to stand out as an applicant in today’s job market with just a resume and cover letter. It can also be tough for employers to find what they're looking for simply by searching for keywords and phrases from those two documents. Seelio's goal is to help students of all ages build easily viewable Web-based displays of their best projects and endeavors. The company launched its website in August 2012. “Since (then) we have been rapidly evolving our website and growing our user base at the same time,” co-founder and CEO Moses Lee said. Seelio joins a new generation of hot Web startups that are following pioneers like Facebook, Twitter and LinkedIn into social media, with a focus on connecting like-minded people. Most of these platforms have built their business models on providing information about their users to advertisers, allowing for hyper-targeted marketing to the site’s users. Seelio’s website does not feature a single advertisement. Similarly to LinkedIn, which has minimal advertising and no usage fee for a basic account, Lee said his company believes that connections made and information displayed by users on the site are more valuable assets than detailed information on consumer likes and interests. “Because we have aggregated a really strong base of highly marketable students who show their creativity, work, passion and skills, companies such as Facebook, Twitter, and Yelp are using Seelio as a sourcing platform for hiring,” he said. That revenue alone might have been enough to begin a business, but Seelio has developed a second revenue stream by selling the site to universities and educational institutions as a customizable way to show off the best work their students produce. “These institutions are thinking about ‘how do we help our students to reflect on and really capture their learning’ so that they graduate with more than just a transcript,” Lee said. Seelio works in Menlo Innovations on a strip of East Liberty Street that is increasingly populated with technology companies. 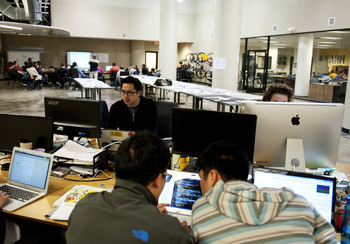 The office space shares a glass wall with student startup incubator TechArb, which Lee previously directed. The University of Michigan, Northwestern, Carnegie Mellon and The University of Texas are among the institutions that have partnered with Seelio to begin the process of building student portfolios. Lee said the company is working with about 25 universities and institutions and he is hesitant to add more too quickly. “We’re trying to work with a fixed number so that we can provide excellent service and an excellent product,” he said. Adrian Fortino, a manager at Detroit-based First Step Fund, was one of the Seelio’s first investors and sits on the company’s board of directors. He said Lee’s combination of experience and passion helped him feel comfortable getting in on the ground floor. “He is as aggressive an entrepreneur as you are going to find, and I say that in a good way,” he said. Lee also helped students build their own startup companies, working previously as the director of the TechArb student startup incubator at U-M.
His current venture is currently an eight-person team and shares workspace with Menlo Innovations in downtown Ann Arbor. Lee said being in Ann Arbor's downtown tech hub has allowed him to find talented employees from the university, and has also afforded him the opportunity to work with U-M alumni who come through town. “There have been a number of people who have suggested to us to take our business to a strategic location on Boston, or maybe the Bay Area,” he said. Tue, May 21, 2013 : 1:34 a.m.
Mon, May 20, 2013 : 12:39 p.m.
Congrats! That's a cool idea. Go! Go! Go! Mon, May 20, 2013 : 10:53 a.m.